I've been off in my meal prep and boy has it shown! We've eaten out or had frozen pizza more often then I want to admit. It was past time to get my act together. I picked up some veggies, fruit, and a large package of hamburger from Sam's. I made a menu and then it was time to get busy. I tackled the package of hamburger. I was able to get three hamburger patties, make a meatloaf, and spaghetti sauce that will be used as part of the menu this week. I also made taco meat and browned a package of sausage. With all that I made I was also able to put two small packages of beef in the freezer. When I was done I had my hamburger patties ready for dinner, a meatloaf mixed up and put into the freezer. The spaghetti sauce was more then I needed for the lasagna. I bagged up what I need for the lasagna and then the rest was put away for future use. The taco meat was broken down into three packages. Two for future family meals and one for a last minute lunch if I don't have leftovers for Chuck's lunch box. I like to have taco mixed this way as I can throw it frozen into the crockpot and have a meal on a busy day or for an after church lunch. The sausage went to the freezer to be used as pizza toppings. Next I put on some eggs to hard-boil and tackled the veggies. I really needed some easy, healthy snacks. I will admit I am sometimes lazy and find it easier to grab a cookie than to take the time to clean a carrot. I looked for some convenient snacks for ideas and this is what I found. 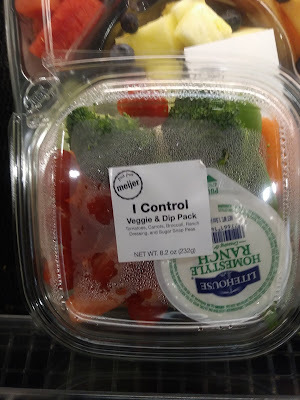 A veggie and drip snack container. 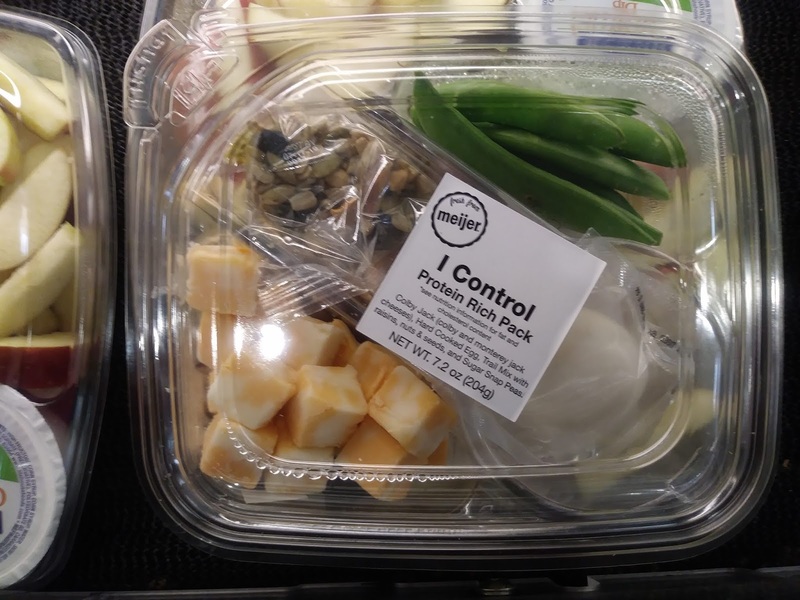 They also had what they called a protein pack that had cheese, nuts, pea pods and a boiled egg. This is the cost of each of those trays. That shocking price was enough to get me moving! While I was cleaning carrots I prepped a pound and a half. I cut slices for a chicken pot pie meal, large chunks for a pot roast, some for cole slaw, and lots of carrot sticks. The lettuce was washed and packaged in serving sized jars and I cut up leftover chicken for toppings. You may notice I wrote on some of the containers. Dry erase markers work great on plastic or glass containers. Now onto convenient snacks. I debated on how to package them. Using containers would take up more room then I had. I ended up purchasing a tray to contain them and packaged the items in snack sized baggies. I invested in some plastic condiment take out style containers also. This is what our new snack area looks like. There is celery, pea pods, carrot sticks along with a single serving of ranch dip. Cheese sticks or containers of cheese cubes along with pepperoni sticks (Megan's favorite), and scoops of cheese ball in the individual containers (my favorite). So far this is working well. Megan has been eating a ton of carrot and pepperoni sticks. Don't worry there is fruit for snacking too. Beside this snack container there are two containers that currently hold apples, oranges, and kiwi. If you have any ideas for keeping healthy convenient snacks on hand I would love to hear about them. Difficult roads often lead to beautiful destinations... keep moving forward, friends. Doesn't it work great to cook multiple meal ingredients ahead of time. I haven't been able to do that lately because I have been being so exhausted all of the time. Come to find out, I have anemia. Now the doctor and I just have to find out what's causing it, then I can get back to cooking ahead of time. That was an eye opener seeing the prices on the store prepared protein rich snacks. I don't know how they sell them at that price. I'm not a fan of raw vegetables, so I steam them. I love broccoli and cauliflower but they really don't smell like roses when I steam them. I wait to do them until my husband is at work as he hates the smell of them cooking. I've been so behind on meal prep too. I've been winging it for a few weeks which isn't really working, obviously. Love your ideas. I have always bought baby carrots so we we a lot of those since there's no prep involved (I know people have issues with them but it works for me.) I always keep a bowl out with fruit - apples, oranges, bananas. It really helps when everything is in sight. I love cucumbers in vinegar so I buy a couple each week and slice them when I get home from the store, put them in a container with vinegar, salt & pepper and keep them in the fridge. Madison and I have been trying to prep on Sundays. This week I did some healthy pumpkin spice muffins...just a box of spice cake mix and a can of pumpkin, some veggies and dip, and some tuna/egg salad. Have a great evening, my friend!